MIPS has 32 "general purpose registers". As far as the hardware is concerned, they are all the same, with the sole exception of register 0, which is hardwired to the value 0. As we'll see later, there are software conventions that restrict the use of registers - an application will run correctly if it follows these conventions, but may fail if it doesn't and it interacts with any other software. (Since all applications interact with the operating system, unless you find a way to load your application onto bare hardware, you need to follow the conventions.) For the moment, we'll only roughly follow some of the conventions. For each example below, we'll assume that the PC points to the first instruction in our code, that we can use the registers called (in assembly language) $t0-$t9 as we please, and that register $gp points to an area in memory that we can use to hold program variables. and further that code has already been executed that initializes pBArray to point to some integer array and to set BSize to the size of that array. 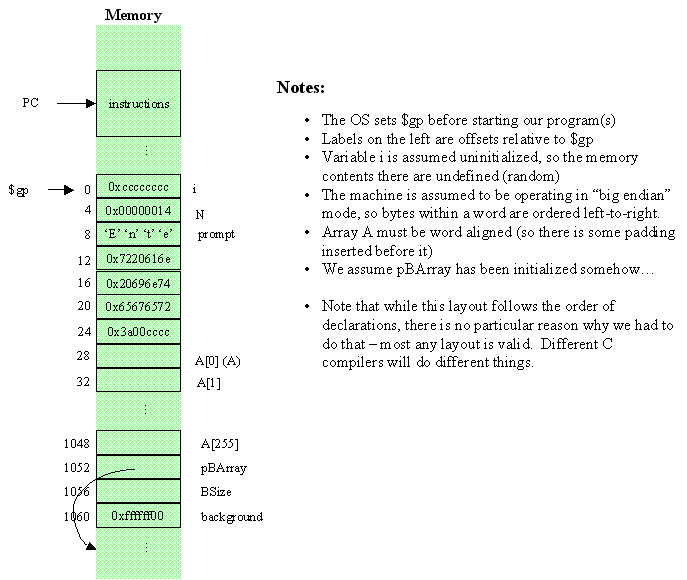 (Depending on the C compiler), the memory layout looks like this. For this example, assume the compiler has generated a branch table and stored it after background in memory (i.e., starting at offset 1064 from $gp). The branch table is initialized to hold in successive locations the absolute addresses of the instructions at labels is0, is1, and is2. slti  $t1, $t0, 3          # i<3? sltu   $t3, $t0, $t1        # have we reached the final address? # NOTE: We have not updated i in memory!